Ashburton Grove - Arsenal news and Arsenal opinion: Walcott woeful as Koscielny and Coquelin shine in Fulham defeat -Miyaichi off? Walcott woeful as Koscielny and Coquelin shine in Fulham defeat -Miyaichi off? Well that was an unexpected jolt to the system. One which will make us reassess our top four ambitions with the current squad we have and make the manager think about who and where he needs to strengthen before the end of the month. Being consigned to our fifth Premier League defeat on the road this season, an area where we were so strong last campaign has to be a concern for the manager. However there are mitigating circumstances - being without four first choice left backs for example. Having no reliable back up for our first choice centre forward. Having no one who will change the game from the bench. And having to play players out of position as cover for injured first choice players. Many of the problems the manager has unfortunately brought upon himself. He knew in the summer we needed back up for van Persie, so who does he buy? Ju Young Park, a player deemed not good enough to make Arsenal's Premier League squad for nearly two months by the man who brought him to the club. But yesterday's match wasn't lost by us not playing our second choice striker. Marouane Chamakh is slow low on confidence, he could only score once against Wojciech Szczesny and Manuel Almunia during the pre-match warm up. For me the African Cup of Nations cannot come soon enough. Hopefully the Moroccan can rediscover his form, but I find it hard to believe he'll find anything, least of all the back of the net. No, the Fulham match was lost in the midfield. We played Alex Song and Mikel Arteta in three games on the bounce. Neither appeared to be at their best last night and because of that Arsenal couldn't control the game. Aaron Ramsey worked hard but he appeared not to have had one of his better games. As for van Persie, the guy needs a break. He looks like he is both mentally and physically exhausted. I think chasing Alan Shearer's goal scoring record has taken a lot out of him. He may tell the outside world he didn't care, but he wanted to prove something to both himself and the outside world. Hopefully two weeks of rest will see him return to his best form when we play Swansea. But I think the worst performance of the night came from Theo Walcott. His anonymous showing at Manchester City was followed up with a marginally better game last night, but he seems to be drifting back to his bad inconsistent ways. If he really expects Arsenal to match his reported £85,000 a week wage demands, he's going to have to play a lot better than he did here. Whilst last season Wenger made three changes during our Christmas week game with Wigan that we lost, last night there were only two changes. Gervinho returning for Andrey Arshavin, whilst the injured Thomas Vermaelen was replaced at left back by Francis Coquelin. The Gunners started the better team, controlling play and passing the ball around nicely. Gervinho was the chief protagonist. He had several early chances. Ramsey had a tame shot and van Persie had a volley which went wide. Gervinho should have been awarded a penalty after being stopped in his tracks by Philippe Senderos who tripped the Ivorian in the box. Referee Lee Probert didn't believe there was anything wrong with the challenge. The first of nearly every decision which went against us. Our goal game from an unlikely source. Laurent Koscielny scoring his first league goal of the season from close range. Gervinho played the ball back to Ramsey who had created space for himself outside the area. The Welshman drifted a cross towards the six yard area where Koscielny jumped unchallenged and nodded the ball in. Cue mad celebrations in the away end. 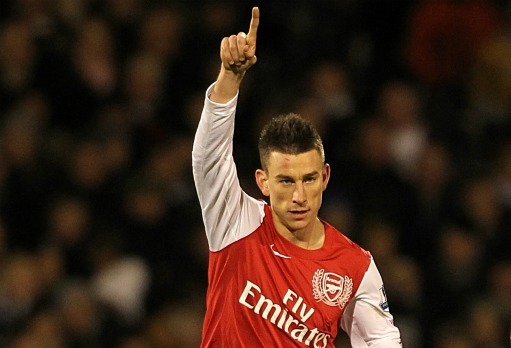 And Robin van Persie's song was hijacked for Koscielny "he scores when he wants". A couple of minutes later we should have been two up, had lucky gone our way. Again Ramsey the instigator of the chance, getting onto a low Walcott cross and forcing Stockdale to make a save which he could only parry. The ball came to Sidwell who attempted to score in his own net, only for the Fulham keeper to produce a block which deflected the ball onto the post. Down the other end Coquelin was like a terrier on the left. He chased and chased and chased. His distribution on the whole was good and his attitude was top notch. He also wasn't afraid to offer an option on the left going forward. Fulham's danger was few and far between. Ruiz wasn't up to much, Koscielny had the measure of Zamora and Mertesacker used his experience to gain Arsenal an advantage when he could. The speed in which we played football in the first half was amazing, considering it was our fourth game inside 12 days. And come the second period, it took its toll on us. We were sluggish. We couldn't hold on to the ball and link defence with attack. Chances were few and far between for us to add a second and as the half wore on it should have been Wenger making the tactical substitutions which would have allowed us to protect our back four more efficiently and create more danger in Fulham's final third. You could see that the home team were growing in stature as Arsenal retreated into their shell. This was when Song and Arteta could have done with the legs of Coquelin around them in the middle of the park. However he was at left back and Wenger's options for trying to retain possession were in the ageing Tomas Rosicky and Yossi Benayoun. Both players did come on. Rosicky for the ineffective Walcott and Benayoun replacing Gervinho. The Israeli was only on the pitch for four minutes before Djourou was given his matching orders for a second yellow card offence, for what appeared to be a push on Zamora. Sebastien Squillaci was thrown on in place of Ramsey to cover the hole left by the Swiss internationals sending off. However the home team pressed and pressed and pressed as they sensed that's Arsenal's physical level had dropped so much they were there for the taking. The goals came in the final ten minutes of the game. From a Fulham corner, Szczesny came for the cross but was unable to take it cleanly. Senderos headed the ball back into the danger area and Sidwell rose above every Arsenal player to head home. Zamora delivered the fatal blow inside the second minute of added on time. The former Spurs man shooting low into Szczesny's corner to send the Gunners home with nothing. "I think it was 100 per cent a penalty on Gervinho from Senderos in the first half. The referee had a massive influence on the game like that. We have played many games recently where if it had gone our way we would not have been in trouble and would have stayed with 11 on the pitch. "You want the right decisions in a game of that importance. But I do not want to speak about that anymore. We had the chances to kill the game off before that and to win. I think it's very unlucky for us to lose the game with 10 men. "When you see the game today that we finished with 10 men, it's very difficult to take. That makes a massive difference when you have played 48 hours before. It's too difficult." The referee was woeful. The number of times van Persie was fouled and he gave nothing is quite scandalous. But then he wasn't giving us any decision all night. The injuries we've suffered aren't the manager's fault. None of the full backs, baring Kieran Gibbs, has any sort of record of being injured for any serious length of time. It's clear we can't go on for any sustained length of time without recognised full backs. Coquelin did well enough last night but against top class opposition he'll be punished. Djourou on the opposite flank has done his best but is clearly being stretched to his limits playing in an unfamiliar position. The manager now has under a week to prepare his squad for the FA Cup game with Leeds. He can also start the much needed transfer business. Last night the away fans sung Thierry Henry's name seven or eight times without him even being present at the game. It appears that he's already being treated by some as the answer to all our problems. I just hope that Gooners aren't getting their hopes up that he'll be the Henry of old. We drop out of the top four because of last night's defeat, but I don't think taking seven points from the last four games is a disaster. We do need re-enforcements and it's down to the manager to decide who and where we need strengthening. This mornings Daily Mirror says we're interested in Sunderland's Kieran Richardson. Whilst they also claim Fulham could be after Ryo Miyaichi.